I love these fries! 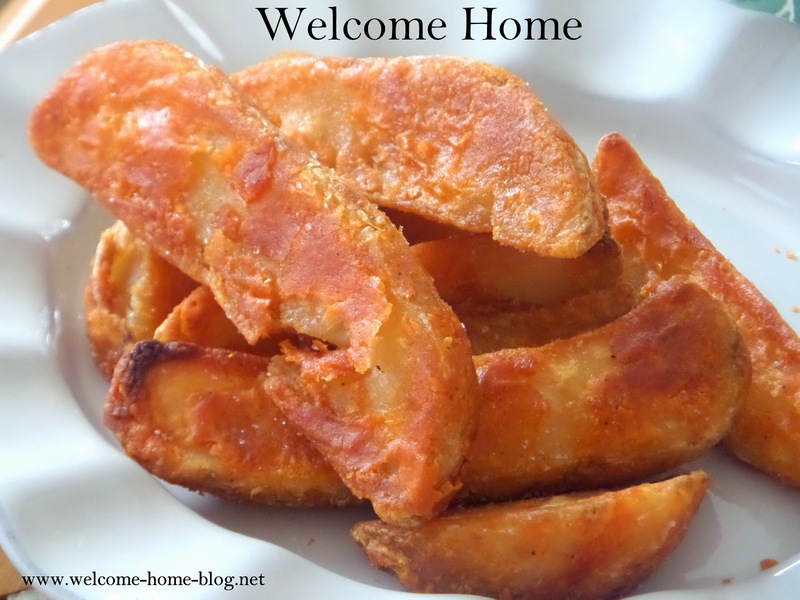 They are crunchy and spicy and so easy to make. I Par-cook my potatoes first so that the inside is done. Then all I need to do is get the outside crispy. I love these served with a little sour cream on the side. I can make a meal out of these! In a large bowl, mix potatoes with 4 teaspoons of spice mixture and 1/4-cup oil. Cover bowl with plastic wrap and microwave for 9 minutes. Drain any liquid and move potatoes to a baking sheet for about 10 minutes to cool. Combine 1-1/2 cups flour and 1/2 cup cornstarch in shallow pie plate or bowl. In another shallow bowl, whisk the buttermilk and baking soda. Working in 2 batches, dredge your potatoes in the flour-mixture first, then the buttermilk, then back in the flour. Deep fry first batch of potatoes in very hot oil for 5 minutes in large and heavy deep skillet. While frying, dredge the second batch. When potatoes are finished frying to a golden brown, remove and drain on paper towels and sprinkle on more spice mixture. Preheat oven to 450 degrees. Drizzle about 3 tablespoons of vegetable oil evenly onto a baking sheet with sides. Combine all of the dry ingredients in a large zip-lock baggie. Add a few potato wedges at a time into the mixture and shake to coat well. Place coated potato wedges onto the cookie sheet, spreading out evenly. Repeat with all of the wedges. Bake for 20 minutes, then flip potatoes and bake for another 20 minutes or until potatoes are tender and golden brown.